Union is a small community that lies along the banks of the Hood Canal’s southern shore in an area referred to as the “Great Bend” where residents enjoy a slower pace of life and awe- inspiring sunsets over the Olympics, with Mount Washington, Mount Constance, and the Brothers rising across the canal to frame an incredible view from almost any vantage point. It holds the title of the first artist colony in the state and is one of the best spots for harvesting shellfish around too, with an impressive bounty of oysters, clams and mussels. 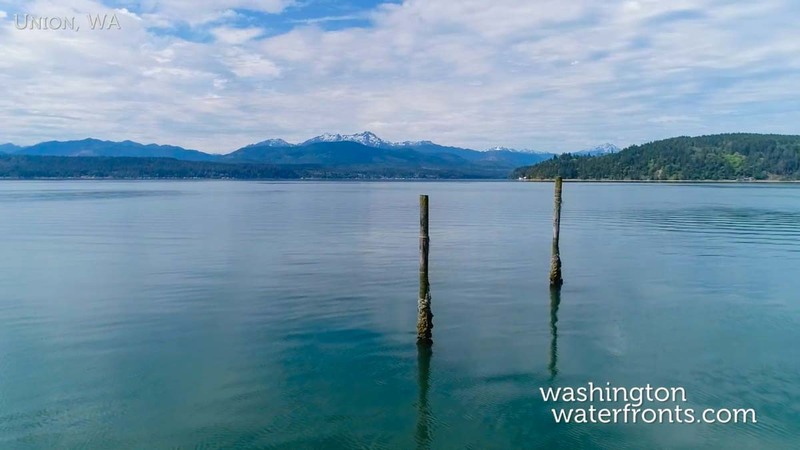 Union waterfront real estate owners can look forward to outstanding fishing for chum salmon in the fall, as well as easy access to public boat launch sites, marinas, a roadside market and working farm. Rare find! This waterfront lot (sold with MLS# 1077943) sits on Hwy 106 at the mouth of the Skokomish River, minutes from the conveniences of Union. Gas and electricity are in the street. This picturesque spot that’s home to just a little over 600 residents is ideal for all sorts of outdoor activities on land and on water, not only fishing and shellfish harvesting but boating, kayaking, bird watching, hiking and much more. Even during the chill of winter, when you own Union waterfront real estate you’ll appreciate being able to gaze out at the herons on the docks. When it comes to breathtaking scenery, Union is truly hard to beat, and has even been named as one of the top 20 prettiest towns in the nation, thanks to its extraordinary vistas. Owning Union waterfront real estate also brings to opportunity to enjoy living in a place that offers a charming small town feel and all sorts of community events to participate in, like Traveler Days, an arts-focused celebration involving art galleries, wine tasting, special events at local restaurants and more. When searching through Union waterfront real estate listings, you’re likely to find waterfront homes available at relatively affordable price points, whether you’re looking for a lot to build a customized home or you hope to move in immediately and enjoy those sweeping vistas and everything else that living on the water in the Northwest provides. Take advantage of our industry-leading tools to make your property search as easy as possible and be sure to register for a FREE account so that you can receive email alerts whenever new Union waterfront real estate for sale hits the market. If you're seeking to sell your Union waterfront property, contact our Waterfront Specialists directly for a comprehensive listing analysis and to learn more about the cutting-edge marketing strategies we'll use to sell your home quickly for top dollar!